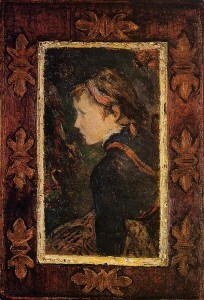 Paul Gauguin had only one daughter with his wife Mette, Aline. 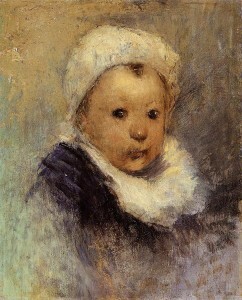 She was Gauguin’s second child with Mette, born December 24, 1877 and named after his mother, Aline Maria Chazal. 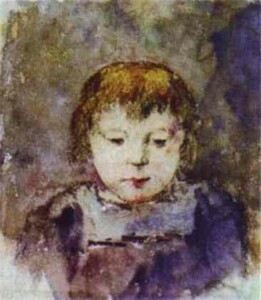 Aline was reportedly one of Gauguin’s two favorite children. In 1893, Gauguin created a little scrapbook for Aline, which he filled with press clippings, prints, sketches and personal reflections. Unfortunately, Aline died before Gauguin was able to give her the book. 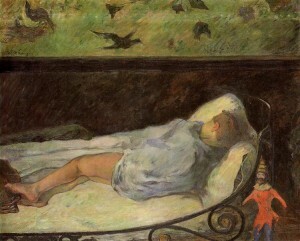 Gauguin had only spent about 7 days with Aline over the previous ten years. He blamed Mette and sent her a series of hurtful letters filled with blame. In May, the land he was renting was sold and he was forced to abandon the house he was building and move to a different house nearby. Over the summer he faced financial difficulties as well as increasingly poor health and began to fixate on his daughter’s death. By year’s end, he had reached a breaking point and claimed to have attempted suicide by drinking arsenic.